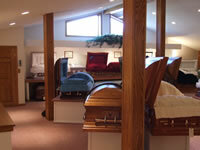 Selection Room - Donaldson Funeral Home, Inc. 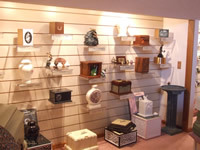 Recently renovated and relocated, our merchandise selection room has the ability to offer a larger selection of casket and urns. Many families do not like the dark and dreary room where the caskets are displayed. Our selection room located upstairs in a large bright cathedral ceilinged room, with outdoor lighting to take away the uncomfortable feeling of the funeral home. Because the room is upstairs, we have handicap accessibility for those that need the assistance. 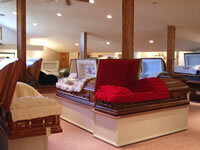 Our casket selections vary with over 60 caskets to choose from. We offer a variety of species of wood, such as mahogany, cherry, maple, oak, hickory, poplar, pine, and veneers. In addition to the wood selections, we offer a wide variety of metal caskets, such as bronze, copper, stainless steel and various gauges of steels. We are additionally proud to offer a variety of interior colors and designs, as well as various personalized back panels, which make your selection more personalized. 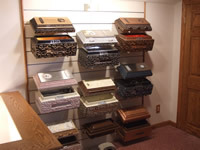 With our full casket selection room, the casket that you select is the one that your loved one will be in, however if you do not see a casket in our selection room, we provide catalogs of various other caskets for you to view. We promise our guarantee that we will find the product that you are looking for. We also offer a wide variety of urn for cremated remains. Our selection varies from the very standard or simple to the very elaborate or personalized urns. As with caskets, urns come many different material such as, crushed marble, polished marble, wood, porcelain, brass, bronze, glass, biodegradable. With the choice of over 50 urns, you are sure to find one that you like. As with our caskets, if you do not find one you like, we have catalogs for you to view. We provide a selection of Wilbert (www.wilbertonline.com) burial vaults. Our vaults are made locally and supplied by Witherbee and Whalen in Canton. * New York State law does not require a burial vault to be used in a public, private, or religious cemetery, however the cemetery may choose to require a burial vault to be used for both full casket and cremation burials. A vault is used to protect the casket from the elements of nature as well as bear the weight of the earth.